Sorry Kanye, sorry Diddy, sorry Taylor, sorry Coldplay. 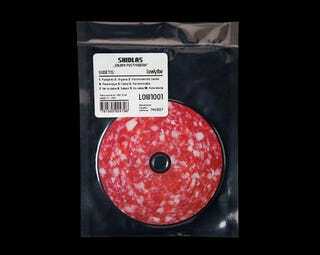 Unless your next album looks like a perfectly packaged piece of delicious cured meat, like Shidlas's Saliami Postmodern, I'm not biting. Sure there's something lost when you download an album instead of buying a physical copy. There's some ritual to sliding out the liner notes and appreciating the album art (after the distinctly less pleasant ritual of tearing off the plastic wrapping and removing that damn top sticker) that is totally lost when that art just exists a thumbnail in iTunes. But by and large, it seems, that ritual isn't enough to keep us buying the real thing. The solution is simple: make the real thing look like a piece of meat. We can't resist it! Above is the new album from Lithuanian musician Shidlas, fittingly titled Saliami Postmodern. It certainly both of those things!